Sat., March 17, 2018, 7:04 p.m.
STANFORD, Calif. – Hands on her knees, China Dow watched intently as the clock ticked down. Finally, she could let out all the emotion and exuberance and began hugging everyone in sight. 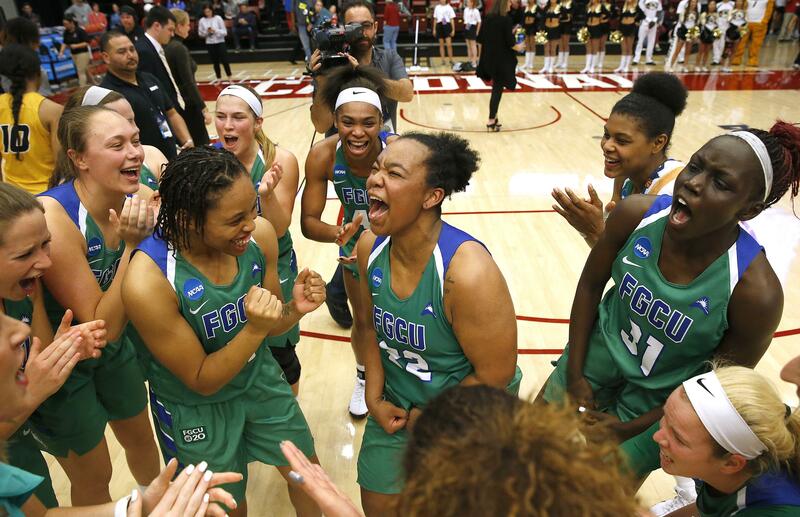 The Florida Gulf Coast senior then skipped across the court in Maples Pavilion screaming in delight while waving her arms toward the fittingly green-clad crowd on St. Patrick’s Day. For the Eagles, the gold was their all-out grit. Dow scored 21 points and played stingy defense in the paint against Missouri star Sophie Cunningham, and No. 12 seed Florida Gulf Coast pulled off an upset in the Lexington Regional with an 80-70 win Saturday against the fifth-seeded Tigers. Cunningham took over on the low block to get Missouri (24-8) going and scored a season-high 35 points – most by a Tigers player in an NCAA tournament game – and made 14 of 16 free throws. But she didn’t get much help. Dow made two free throws with 1:12 left as the Eagles kept pushing until the final buzzer to run their winning streak to 11 games with a 21st victory in the last 22 games. Florida Gulf Coast (31-4) will play Monday against No. 4 seed Stanford (23-10), an 82-68 winner against 13th-seeded Gonzaga in Saturday’s second game. Hall of Fame Cardinal coach Tara VanDerveer will face Eagles coach Karl Smesko after VanDerveer won her 900th career game against him at Puerto Vallarta, Mexico, in November 2013. Leading scorer Rose Julien – averaging 13.4 points – added 12 points for Florida Gulf Coast, which is in the NCAA tournament for the fifth time in seven years with Division I postseason eligibility and won an NCAA game for the first time since beating Oklahoma State in 2015. The scrappy Eagles stayed within 36-32 on rebounds to Missouri without having a single 6-footer on the roster. “It’s an upset in terms of seeding, but we definitely came in with the mindset that this was a game we can win if we executed at a high level,” Smesko said. Lauren Aldridge’s 3-pointer with 2:13 left in the third cut FGCU’s lead to 54-50 then Tytionia Adderly immediately hit from deep on the other end and the Eagles led 61-53 going into the fourth. Florida Gulf Coast didn’t immediately get the kind of 3-point looks it is so used to, but the Eagles patiently kept pushing the ball in transition and drove to the basket and kicked out to start creating those crucial open looks from deep. Mizzou won its SEC Tournament opener and earned a third straight NCAA berth, the first time the program has done so since 1984-86, but missed out on earning at least one victory in three straight tournaments for the first time in school history. Florida Gulf Coast got key minutes off the bench from Jessica Cattani, who hit two quick 3-pointers during an 8-3 second-quarter run, then Cunningham converted back-to-back layups for Missouri. Cattani finished with 10 points. Late in the second after Dow hit a 3-pointer on the other end then pounded with Cunningham inside and other FGCU defenders swarmed, Cunningham still was able to find a way to almost underhand the ball up and into the hoop. Dow hit another 3 the next time down and her team led 41-32 at halftime. Even with a big performance, Cunningham expected more of herself given her height advantage. She shot 10 for 16 but also committed five of her team’s 16 turnovers. Florida Gulf Coast: The Eagles converted just 23 of 37 free throws, probably something that will be a focus going into the second round Monday. … FGCU missed its first four shots before Nasrin Ulel’s driving layup at the 7:36 mark of the first quarter. … The Atlantic Sun Conference champions use the hashtag “RAININGTHREES” as a catchphrase for their 3-point prowess. They have made 414 3s this season, 10 off Sacramento State’s single-season record of 424 set in 2014-15. Missouri: The Tigers shot 4 for 24 on 3s. … Cunningham notched her 13th game this season with at least 20 points. … Jordan Frericks had two early blocked shots to help the Tigers establish their defense in the paint and on the perimeter. Published: March 17, 2018, 7:04 p.m.